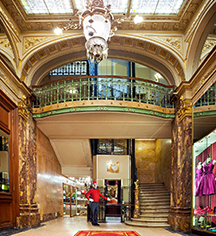 Hotel Metropole has kept legendary watch at Brussels’ majestic city center since 1895. Its guestbook alone is an elaborate account of famous figures who have walked its halls -- chancellors and generals, award-winning actors and artists, and a dazzling array of dignitaries. Throughout this iconic hotel’s 119-year history, gracious welcomes have been extended to Albert Einstein, Marie Curie, Caruso, and Arthur Rubinstein. 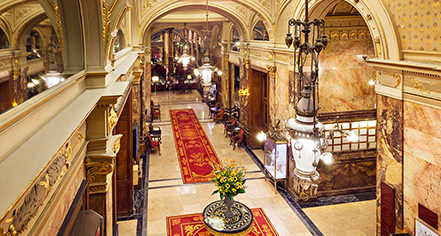 The lobby of Hotel Metropole is a monument to the palaces of the French Renaissance with sweeping marble staircases, wrought-iron furnishings, stained glass, and leather couches. In fact, the hotel's façade and ground floor have been designated as historical landmarks by the Council of Monuments and Sites of Region of Brussels-Capital. An award-winning, Brussels five-star hotel, the Hotel Metropole is a showcase of a uniquely Belgian ambiance, gathering accolades for “Best Large Business Hotel of Western Europe” by Business Destinations and a “Special Mention” in the Brussels Enterprise Awards as a destination of historic grandeur. After extensive renovations restoring the architectural wonders of this historic hotel, Hotel Metropole is once again one of Brussels’ grandest hotels, a property with elegant service standards and a perennial favorite of discriminating travelers. Hotel Metropole has extensive famous guest list including: Nobel Prize recipient Marie Curie, rapper 50 Cent, and British diplomat Sir Alexander Codagen. Hotel/Resort Fees & Taxes: A tax is imposed by the city: EUR 4.24 per accommodation, per night. Pet Policy: Service animals allowed: Yes. (Fee exempt) Pets allowed: Yes. Fee: €50 per night per pet. Maximum weight: 20 kilos. Guide dogs are fee exempt. Transportation: Private limousine hire may be arranged through the concierge; rates apply. Hotel Metropole has kept legendary watch at Brussels’ majestic city center since 1895. Its guestbook alone is an elaborate account of famous figures who have walked its halls -- chancellors and generals, award-winning actors and artists, and a dazzling array of dignitaries. Learn more about the History of Hotel Metropole .